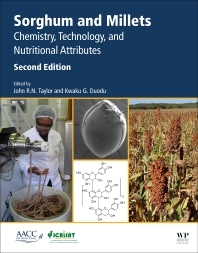 Sorghum and Millets: Chemistry, Technology and Nutritional Attributes, Second Edition, is a new, fully revised edition of this widely read book published by AACC International. With an internationally recognized editorial team, this new edition covers, in detail, the history, breeding, production, grain chemistry, nutritional quality and handling of sorghum and millets. Chapters focus on biotechnology, grain structure and chemistry, nutritional properties, traditional and modern usage in foods and beverages, and industrial and non-food applications. The book will be of interest to academics researching all aspects of sorghum and millets, from breeding to usage. In addition, it is essential reading for those in the food industry who are tasked with the development of new products using the grains.